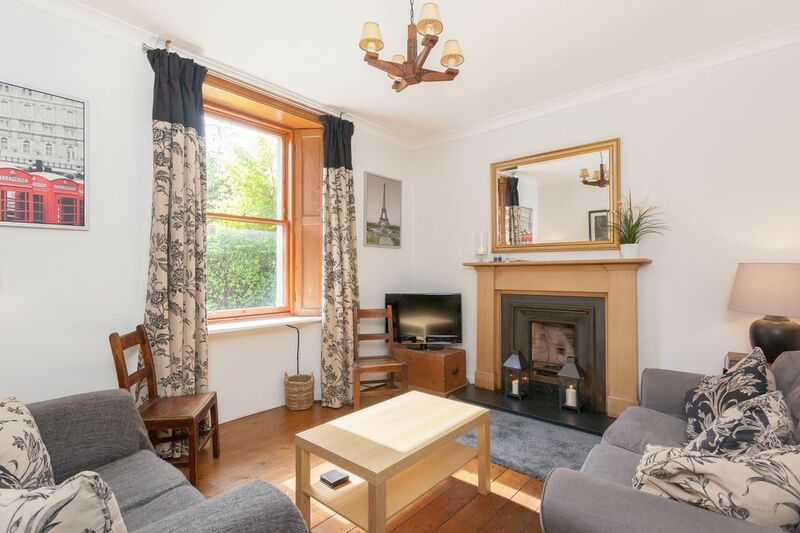 Beautifully furnished 2 double bedroom main door Colony Cottage in the sought after area of Gardner's Crescent with excellent amenities and transport connections, having Haymarket Rail Station and Princes Street only minutes walk away. The property is on the Ground Floor and it has its own private entrance main door and also its own private garden where guests can enjoy peaceful outdoor space despite being in the Centre of Edinburgh. There is freeview television, free Wi Fi broadband connection, full size dishwasher, washer & dryer, fridge freezer, Smeg double oven and gas 4 ring hob. Other items provided include - an iron, ironing board, hairdryer, washing line (in garden) & clothes pegs, clothes horse, small portable steps, mop & bucket, miele hoover and some smalll childrens toys. There is a dining bar which seats 4 guests in the kitchen. A full security alarm is also fitted in the premises. Yes - All clean linen is provided ready for occupation on check in. Toys are available upon request - please advise. The home is situated in an ideal area of Edinburgh where we were capable to walk around to see the main tourist area and sites. Yet is was very quiet. The terrace house is an older building, but the heating works very well and the kitchen is new. And it was very clean. The beds were very comfortable. Rory was a great help and very fast in responding. The only thing that was a little tricky is parking. But between parking on the main road and parking in a nearby parking garage we were able to get by. We had a great stay, the place is quiet but perfectly situated close to downtown. Comfortable beds and soft linens. We’ll stay here again when we’re back in Edinburgh. Very comfortable and convenient cottage for EIC centre and Edinburgh’s tourist locations! My experience at this property was outstanding. The owners provided excellent information regarding checking in and directions prior to our arrival that were very helpful. Once on site there were great directions for appliances, local attractions, groceries etc. Location was very close to what we needed. We thought we were having a minor problem on site, contacted the owner who responded immediately and explained the issue and even stopped over to property to make sure everything was okay. Couldn't have had a better experience. The home was exactly that a very beautiful and charming home! It was an ideal location. The owners were easily contactable and so accommodating. We were so impressed and will look no further than Rose Bank Cottages when we next stay in Edinburgh. Thank you!